Patients with brain tumor-related epilepsy (BTRE) suffer from two serious pathologies simultaneously – a brain tumor and a secondary form of epilepsy. Although there has been remarkable progress in BTRE research in recent years, it remains an on-going challenge for clinicians and continues to stimulate much debate in the scientific community. This volume is the first to be completely dedicated to BTRE, and in doing so it explores issues faced by the health care team as well as some of the novel and promising directions that future research may take. 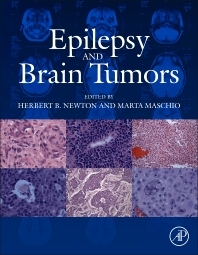 Epilepsy and Brain Tumors is not only a complete reference on BTRE but also a practical guide based on clinical experiences, with a comprehensive collection of presentations from international experts who share some of the latest discoveries and their approaches to tackling a wide range of difficult and complex issues. Is There a Best Practice for Seizure Treatment? Dr. Marta Maschio is Neurologist, Epileptologist, and Director of The Center for Brain Tumor-related Epilepsy, Regina Elena National Cancer Institute in Rome, Italy. Since 2005, she has been Director of this unique center, one of the few in Europe dedicated entirely to patients with Brain tumor-related Epilepsy. Known for her ability to think outside the box, Dr. Maschio is constantly searching for innovative approaches to improving patient care for this complex pathology, where epileptologists are rarely part of the patient’s primary care team. She is dedicated to changing that through educational initiatives, membership in the leading international organizations in the field of epilepsy, and by publishing her research in leading scientific journals. In addition to her clinical work, Dr. Maschio is an active researcher and has published over 100 articles on BTRE and numerous book chapters. She also contributed to the development of BTRE Treatment Recommendations published in 2008, as member of the Italian Scientific Committee, designated by the Italian Association for Neuro-oncology. Since 2011, she has been Co-Director of the Neuro-oncological Section, International School of Neurological Science S. Servolo, Venice International University, and since 2012, is National Coordinator of the BTRE Study Group, Italian Society against Epilepsy. In 2010, she created her Centers’ web portal, the first in the world exclusively for BTRE patients, of which she is very proud. On a personal note, she has also won several national poetry awards. "In the last two decades, neuroscience research has made a big leap forward. The emergence of sophisticated genetic and molecular tools, combined with imaging techniques of unprecedented spatial and temporal resolution, and their application to in vivo models of major brain diseases allowed spectacular progress in our understanding of the structure and function of the brain in health and disease.